This course will guide you through setting up and starting your new saltwater aquarium. If you prefer an email class format where the daily lessons are emailed to you on a daily basis, you can sign up for those classes at Saltwater Aquariums 101 - Getting Started. Today we will be determining the type of aquarium you will be starting as well as the right location for your new tank. But first, let's dispel some rumors that you may have heard. To put your mind at ease, over the years, many inaccurate legends (myths) have been generated about how difficult saltwater aquariums are to keep. Top Saltwater Aquarium Myths details a number of these myths and explains why they are inaccurate. A freshwater aquarium is a bit simpler to set up and maintain than a saltwater aquarium. However, if the 10 Most Common Mistakes are avoided, they are really not all that difficult. While you can create a marine aquarium system that uses every possible piece of equipment on the market, the Sample 55g FOWLR Saltwater Tank demonstrates how a basic aquarium system can produce equal or even better results. The old saying "keep it simple, stupid" certainly applies with aquariums. Fish Only, Fish Only With Live Rock, or Reef Tank? To get started, you will want to decide which type of system you want. Even if your dream is having a Reef Tank, complete with corals, fish, and invertebrates, you can start with a basic Fish Only (FO) or Fish Only With Live Rock (FOWLR) tank, upgrading it over time. You can also create a Mini-Reef Tank which has all the basic equipment, will fit almost anywhere, and is more affordable for some. If you haven't decided what you want your tank to look like in the end, you can surf through the photos in the Top Reef Tank Photos Galleries. Now that you have decided what you want your tank to look like, you will want to Choose Your Tank Location. 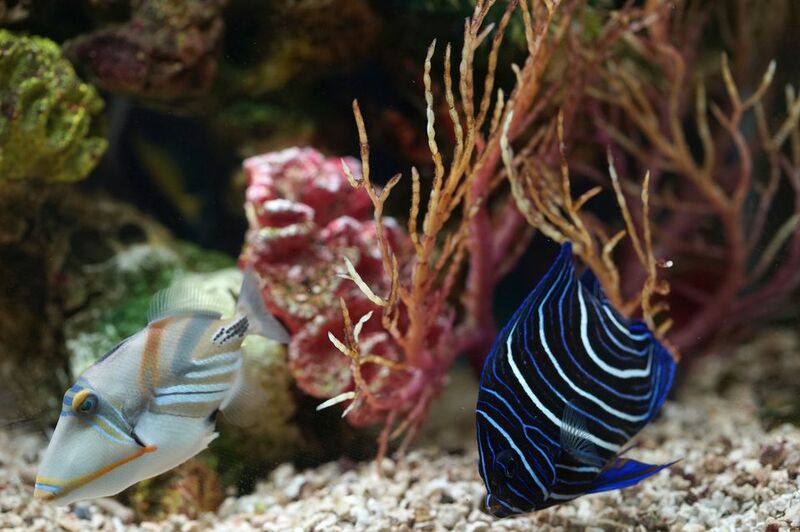 Keep in mind that moving a saltwater aquarium is not a simple process, so pick your location carefully. Now that you have decided where you will be placing your new tank, you can Choose Your Tank, Stand & Hood which will work for the space you have. There are a number of aquariums (compare prices of Mini/Nano Kits, 1 to 50 Gallon Aquariums, and Showsize Display Aquariums) on the market which may work for you. If you enjoy creating things on your own as well as saving money, DIY Glass Aquarium Plans and DIY Aquarium Cabinet/Stands may be for you. Keep detailed notes on everything you do with your tank, from construction to equipment to adding critters and test results. As time goes on, you will thank yourself for keeping a detailed log of everything you do with your tank. There are a number of freeware and shareware tank logbook programs available. Pick the one that works best for you and start logging today. Today we will be we will be learning about and choosing the heart of your new aquarium: the filtration system. A healthy biological filter will allow your tank and all of its critters to thrive. What Is A "Biological Filter"? Sumps are normally placed under the aquarium and are used to contain wet/dry (biological) filters, protein skimmers, heaters and other devices as well as to grow denitrifying algae and mangroves. What is a Sump and Do You Need One? will help you to decide if this useful piece of equipment will work for you. You can Compare Prices of Sumps/Wet/Dry Trickle Filters available on the market to give yourself an idea of what using a sump type filter will cost. Many saltwater aquarists save money with a DIY Sump or using a Cheap, Easy DIY Sump. Protein skimmers help remove biological waste from your tank before being processed by the biological filter. What is Protein Skimming? explains what they are and how they work. You can browse through the latest models of Tank Mounted Protein Skimmers and Sump Mounted Protein Skimmers to see what will work best for your aquarium. Again, if you are handy with tools and like to create, DIY Skimmers will be very helpful. Canister Filters have evolved over the years to become much more than a simple mechanical filter. Many of these filters now incorporate mechanical, biological and chemical filters all in one neat package. Canister Filters Profiled describes what the Top Canister Filters are capable of. Simple and efficient, a single canister filter unit can quickly solve all of your filtration needs. Wet/Dry or "Trickle" Filters are simple devices which process ammonia and nitrites and increasing the DO (Dissolved Oxygen) content in tank water. The Top Under Cabinet Wet/Dry Aquarium Filters are popular with saltwater aquarists as well as easy to install. DIY Wet/Dry Filters are easy to make and can save you a lot of money. The Jaubert Live Sand and Berlin Filter systems were among the first filtration innovations to make keeping a saltwater aquarium plausible. While they are simple in design, they do have some limitations. Power Outage! Your Tank Is Dying! What Are You Going To Do? Realistically, you will experience a power outage in the future. Your tank can survive for days without lights, but your biological filter, corals, critters, and inverts will start dying in a few hours without Oxygen, water circulation and the proper temperature. If you total the replacement cost of your tank critters, live rock, live sand and corals, you will quickly see that investing in an alternative power source to save your tank isn't really all that expensive. With a little imagination, you may find that a small generator will be very useful in your everyday life. That's it for today. Tomorrow we will determine which lighting, live rock, substrate and sea salts will work best for you. Today we will be learning about which lighting and sea salts are the best for you as well as live rock and the substrate. If your plan is to start off with an FO or FOWLR tank and move up to a full reef tank in the future, this is an opportunity for you to choose basic lighting fixtures which can be upgraded to Reef Tank Lighting. Understanding Lighting Fundamentals will help you to make wise choices. Top HO & PC Fluorescent Light Fixtures, T-5 HO Fluorescent and Top Metal Halide Fixtures will give you an idea of the cost of these lights. The most recent advance in reef tank lighting is the LED lights. While they may cost a bit more to buy initially, the cost savings of LED's (50,000 hours vs 4.500 hours for bulb life and a fraction of the power consumption) over the long haul makes them an excellent investment. Compare Prices of LED Lights. DIY Lighting Fixtures are an easy way to save money on your new tank. Most of the plans require only basic tools and are easy to construct. DIY's are a great way to design fixtures which can be upgraded in the future. While many aquarists elect to top off their tank with only a lighting fixture, others prefer the finished look of an Aquarium Lighting Hood. Diy Canopies/Hoods also offer you the opportunity to customize the look of your tank and save money at the same time. Live Rock serves a number of functions in a saltwater aquarium. Tips For Buying Live Rock will help you save money while understanding the Grades of Live Rock and deciding if Cured, Precured, or Seeded Live Rock will work best for you. Knowing How to Cure Live Rock will save you time, money and frustration. If you elect to use a Berlin Live Rock Filter the grade of rock is very important. Choosing the Right Substrate for your saltwater tank, to begin with, is very important. The substrate in your tank is not only decorative, it serves a number of functions. It can be part of your biological filter (Jaubert Live Sand Systems) as well as house small sand dwelling critters in reef tanks. You will also want a substrate that will stay put and not fly around the tank in the water currents. You Compare Prices of the Top Marine Aquarium Substrates to get an idea of what the different brands and types of sand will cost. Choosing the best sea salt to use in your tank is important, particularly if you have a reef tank. Sea Salt Mixes - Which Brand is the Best to Buy? will help you decide which will work best. You can see what other aquarists use in the Sea Salt Mixes Poll. Compare Prices of the Top Sea Salt Mixes to see what each brand will cost you. There are a number of items that you will want to obtain before you set up your tank. Take the time to investigate before you buy. Quite often the best product for your purpose is not always the most expensive. Once your tank is set up and running, you will soon discover that understanding water chemistry, particularly pH and alkalinity, will be essential to your success, particularly if you plan to create a reef system. Thomas Hynes does a great job of making learning fun and easy with his 4 part "Basic Chemistry" article series. Good news! Now that you have your tank and equipment as well as learned how your tank works, tomorrow we will put it all together and fire it up. We will also be picking the tank critters for your new aquarium. Today we are going to assemble your new tank and all of its equipment as well as learn about the fish, invertebrates, and corals that will work for you. Aquarium Set Up in 10 Easy Steps will walk you through the process of setting it all up and getting it running. When researching new additions for your tank keep Compatibility in the front of your mind. Using the Fish Care Ratings Chart to help you determine how difficult each fish will be to maintain. To begin with, you will want to stay with critters which are fairly easy to keep successfully. As you gain experience you can move on to the more difficult species. Fish Compatibility Chart will give you a quick look at which fish will generally get along with each other. Terrific Beginner Fish a wide variety of colorful fish which adapt well to aquarium life. What to Look for When Purchasing Fish helps you avoid purchasing a less than perfect specimen. Fish Photos Gallery help you see what your tank will look like. Fish Profiles let you know what your new fish will require. There is a number of Reef Safe Invertebrates which are terrific tank mates in most aquariums. Adding Reef Safe Janitors to your tank will help keep algae growth in control as well clean the substrate. Invertebrate Profiles and the Invertebrates Photo Gallery will help you plan your aquarium. Take the time to do the research before you buy and you will be rewarded with a happy tank. Staying with the 15 Easy Corals, to begin with, will greatly increase your success with until you gain experience. Every saltwater aquarium experiences algae blooms. Algae is part of the marine environment, so just accept that it will happen and be prepared. Almost all aquariums experience a Brown Algae bloom shortly after the cycle has completed. This algae is a nuisance but doesn't really harm anything in the tank. About Brown/Golden Diatom Algae gives you the information you will need to lessen the impact. Green Hair Algae generally shows up a month or 2 after the cycle is finished, but can appear almost any time the proper nutrients are present. Curing Nuisance Green Hair Algae gives you the information you will need to prevent and treat an outbreak. Red Slime Algae is the scourge of saltwater aquariums. Not really algae, but a diatom (bacteria) instead, the cure is pretty straightforward. Tomorrow we will be learning about quarantining new tank critters to avoid bringing diseases into your new tank, as well as tank maintenance, fish foods, and feeding. Is a QT Really Necessary? Experienced aquarists have found that (as the FAQ - Quarantine Tank Benefits? shows) quarantining their new arrivals before adding them to your tank helps avoid infecting the tank with parasites and other diseases. Saltwater aquariums require regular maintenance to keep the water quality high and the occupants healthy and happy. Maintenance time and frequency can be greatly reduced if your filtration system is chosen wisely to begin with. "What Maintenance Procedures Should Be Performed, and When?" will help you determine which and how often maintenance tasks should be performed on your tank. Regular water changes are performed to reduce toxins (nitrates and phosphates) as well as to replace essential minerals and trace elements in a saltwater aquarium. Using Nitrate Absorbents and Phosphate Removers in your system can greatly reduce, but not eliminate the need for water changes. Another way to reduce your nitrate and phosphate levels is to use the "Vodka Method" of Nitrate Reduction. It utilizes the "free carbon" in the ethanol to stimulate certain bacteria to consume the nitrate and phosphate molecules. The materials (such as: How Often Should I Feed My Fish? and Fish and Invertebrate Foods and Feeding in Foods, Feeding, and Nutritional Issues will help you determine what and how often to feed the critters in your tank. Many aquarists have found that using Automatic Fish Feeders keeps their tank critters on a regular feeding schedule as well as prevent over feeding. The most common disease in saltwater aquariums are the parasites Oodinium and Cryptocoryne. The best prevention of an infestation is to carefully inspect fish before they are purchased and quarantining new arrivals before introducing them to your tank. Accurate and rapid diagnosis is imperative. Osmotic Shock is an effective drug-free treatment. The Top Parasitic Medications are also effective. Emergency! Plan ahead for Power Outages. You will experience them at the worst possible time. Being prepared can and will save your tank and its occupants. Aquarium First Aid Kit Assemble an Aquarium First Aid Kit for your aquarium as soon as possible. Forward thinking (planning ahead) will pay huge dividends. What Is a Fish-Only Saltwater System? What Makes a Saltwater Aquarium a Reef Tank?